We will make sure that each one of your wedding photographs captures the beauty of the moment so that you have a pictorial chronical of your love story that will last a lifetime. The Sand Castle is a renowned and revered wedding venue that days back to the 1940s. Once named the Casa Seville, the venue has hosted many splendid galas and gathering attended by numerous notable individuals. The Sand Castle’s elegance has been restored, making it one of Long Island’s most popular wedding venues because it provides the perfect romantic setting for your special day. Because the Sand Castle is devoted to making your wedding day special, they only host one wedding at a time. You and your guests will receive the ultimate VIP treatment from the moment you walk through the doors. The white-glove service and award-winning cuisine will not fail to impress. Inspired by European chateaus, this venue has a classic ambiance, excellent service and an air of sophistication. 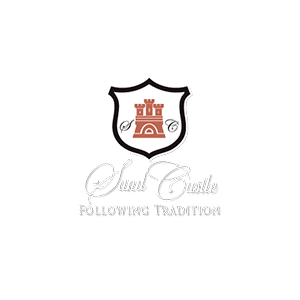 The team at the Sand Castle guarantee that you and your friends and family will be astonished by their attention to detail. When it comes to dining, any special requests will be happily accommodated for by the Sand Castle’s Executive Chef, John Arenth. This venue has several amazing spaces for you to receive and entertain your guests. The Foyer: As your guests arrive, they will be welcomed by a uniformed doorman and led into the foyer. This elegant room has three fireplaces and is furnished with rich mahogany accents and European marble. The Hospitality Suite: Your friends and family will feel right at home in this comfortable lounge with its plush seating and granite top bar. They can relax and enjoy the complimentary cocktail service, canapes, and hors d’oeuvres. The Atrium: This heated glass enclosure is the perfect space for your wedding ceremony. It allows you to have an outdoor wedding any time of year. The Gazebo: Perfect for a summer wedding, the gazebo is surrounded by majestic gardens and a beautiful pond. The Veranda: This space overlooks beautifully landscaped gardens and features a granite waterfall and an outdoor bar. The Skylight: This cocktail lounge has a beautiful stained-glass skylight, rich mahogany furnishings and granite-topped stations featuring world cuisine. The Ballroom: Lit by sparkling chandeliers and soft candlelight, you and your guests can dance the night away surrounded by elegant décor; it will make your affair unforgettable. The Bridal Suites: The Sand Castle offers three luxurious bridal suites, each featuring a mini bar and monitors playing live footage of your event. The suites are also provided with full service, for your comfort. Let’s set up an appointment to meet and talk about your Sand Castle wedding plans. While we are getting to know each other, we can show you our portfolio, and we can discuss different styles of wedding photography. We can’t wait to meet you.